Stress level: Low, Similar characteristic flavors to previous batch. Total Viable Cell Density – The number of viable cells in one milliliter of homogenized slurry. 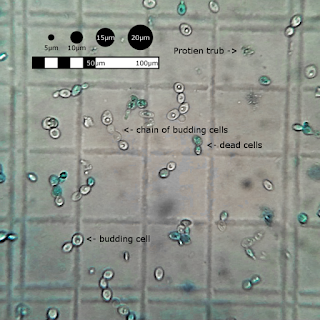 Thick Viable Cell Density – The number of viable cells in one milliliter of settled cells such as those at the bottom of a starter that has been refrigerated. 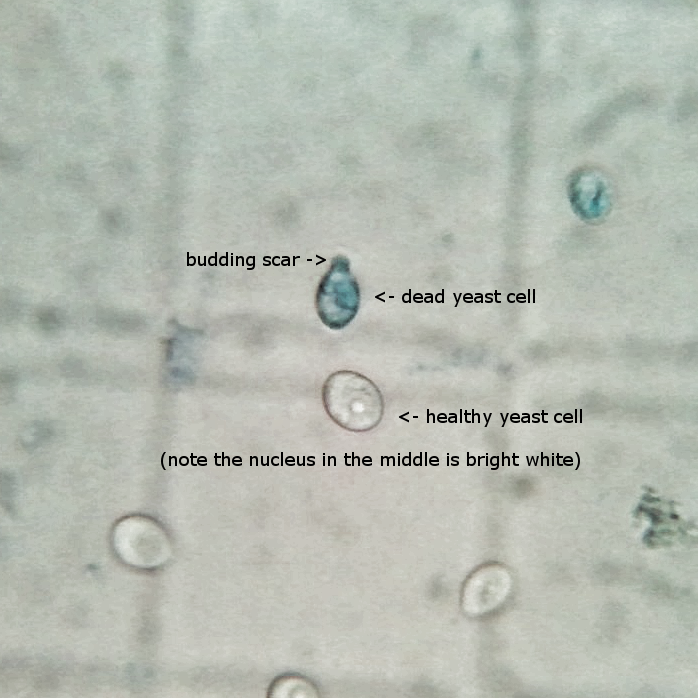 Stress Level – A rudimentary assessment of cell health based on cellular morphology. This report is an evaluation of the sample that was provided. There are no guarantees. The sample may perform differently than the slurry for a number of reasons that are beyond control. Care is taken to provide accurate results, however measurement error due to equipment tolerances, process, and calibration will create deviation in measurement from absolute values. This is not an evaluation of health or safety risks. 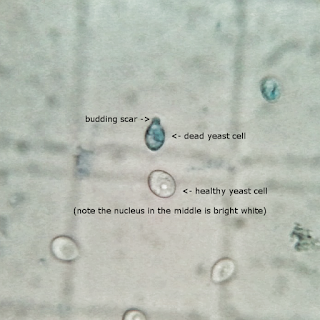 The bright white nucleus seen in the viable cell indicates that there was excellent dye rejection by the yeast cell. Methylene blue works by binding with acids, such as DNA. Even inside the DNA dense nucleus there is no dye. This is a strong health indicator. was this from an unopened vial, or post fermentation. If so, do you have the fermentation info (start/harvest)? Oh wow, I would have expected a higher viability %, right - unless the vial used was really old to begin with? Do you know what the packaging date of the vial is/was? The low viability may have been from freezing during transportation. The sample was sent in the mail and it took several days to arrive.